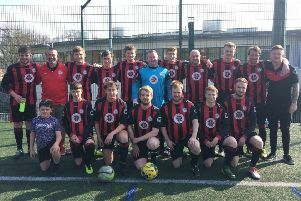 Sowerby Bridge and Shelf United maintained their Premier Division title challenges with wins in the Halifax AFL on Saturday but Shelf FC’s chances of retaining the crown are slipping away. Bridge had to dig deep to overcome neighbours Sowerby United 3-2 in a pulsating game at Walton Street while Ben Grech scored both goals as Shelf United won 2-0 away to Midgley United. The gap between leaders Bridge and third-placed Shelf United remains at four points with United having two games in hand. The pair are set to clash on April 10. Bridge’s first task, though, will be to overcome Shelf FC on Wednesday evening and the strength of the visitors’ challenge could depend on whether they believe they can still retain the silverware after a 3-3 draw away to Hebden Royd Red Star on Saturday. Sowerby Bridge fell behind to a contender for goal of the season from Sowerby’s veteran striker Lee Barber, whose bullet of a shot from 30 yards flew into the net. Pressure mounted from the Bridge and they drew level when they were awarded a penalty for a push and Adam Barlow scored from the spot. United went ahead again when Tom Hosker fired home from the edge of the box but a fine move brought Bridge level. Sam Hiley did well on the right and delivered a cross that Martyn Bates headed home. It was now end to end with United defending well and Josh Hiley and Dan Crosland stand-out figures. Six consecutive corners tested United but they stood firm until Joel Cleary finally scrambled home the winner. Shelf United did the hard work in the first half at Midgley Rec, taking a 1-0 lead against the wind and slope. The visitors coped well against the expected challenge from long throws and set piece deliveries in the first half, with Jonathan Farrell to the fore. Grech was presented with the opening goal after half an hour, a mix-up between keeper and defender leaving him with a walk-in. Luke O’Brien, Shelf’s man of the match in the centre of the park, missed a golden chance to double the lead a couple of minutes later. The visitors looked fairly comfortable in the second half. Billy Grogan missed from close range but Grech made the points safe with a low shot from the edge of the area after 75 minutes. The contest between Red Star and Shelf FC was a fluctuating affair. Star looked in control when they led 2-0 at the break. Lewis Cockroft scored a penalty and then claimed a second. Shelf FC substitute Alex O’Keefe turned things round for his side with three goals in quick succession after the break. Red Star conceded two soft penalties before the visitors’ tricky front man added a third. However, Will Chadwick scrambled a late equaliser for Star and a draw was arguably a fair outcome.